covered Oreos) will look fancy. I totally recommend them! 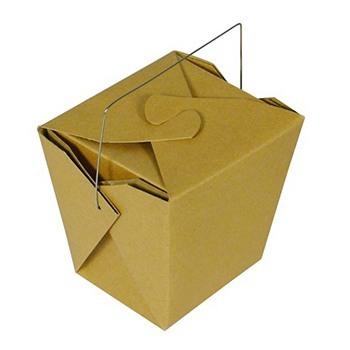 These takeout boxes were perfect for our Chinese Red Egg and Ginger Party. I love how they are available in so many colors and they were the perfect size to fit the customized fortune cookies. I was impressed at how quickly this was delivered to me. Great little boxes - just perfect! Used as wedding favors - the perfect size to hold a little candy! I ordered the red boxes to match our colour theme. They're very cute and fit 2 fortune cookies perfectly. The only downside is that they're not very environmentally friendly as they're made of plastic (yes I did know that before I purchased) and each box is wrapped with a plastic bag. Would definitely recommend Beau-coup to carry the cardboard style. I will use them as favors/candy table for my wedding. I had to order stickers for them because they are not personalized. adorable containers to fill with treats! We filled with salt water taffy. The concept was well received and unique but we could only fit approx. 8 pieces per box and label graphics were small and difficult to read. All in all a huge success however!!! Used these containers for personalized M&M's at my daughters bridal shower. They can hold quite a bit, and I really liked that. Added the ribbon and personalized tag and set them at each place setting. They looked so cute and we got so many compliments. 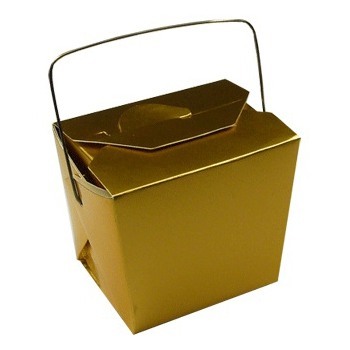 I'm using this togo box w/fortune cookies as wedding favor for my guests. They are so cute and such a unique gift. These were perfect to hold our wedding favors.. We didn't want to have to stuff bags or netting and tie shut. We got the personalized fortune cookies and placed them in the Takeout Box. Then we tied a Bow with the personalized ribbon we had. The color we got was a perfect match to the wedding colors AND you could get samples of different colors to see which shade was best. That way we didn't order 200 and get a dark color or something. Also after the guests eat the cookie they can use the cute little box to store something or decoration in their own home. just the right size for favors,kids had fun filling with candy. Perfect for guests to take home left over cupcakes at our wedding! The size and color are just what I was looking for. These will be used for my candy buffet. Perfect size for putting candy in. 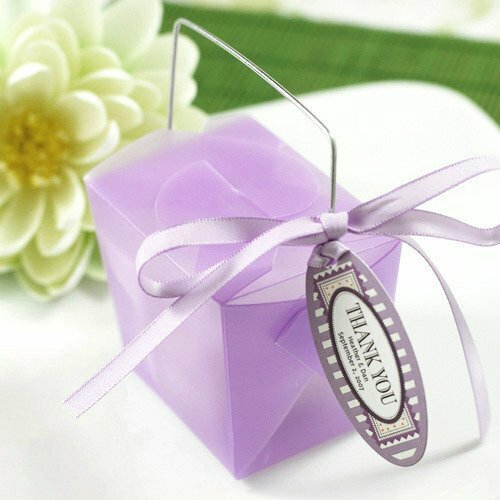 It is the perfect size for favors and is an inexpensive way to add some fun and whimsy to any celebration! Filled with sweet treats for bridal shower favors and added personalized tags from Beau-Coup that said (the bride's name) thanks you for the sweet beginning. Can't wait to share them at the shower being held at an Asian tea room. best unique gift packaging so far! Love this packaging that went along with the customized fortune cookies for my daughters wedding! Used for a bridal shower gift and everyone loved it. 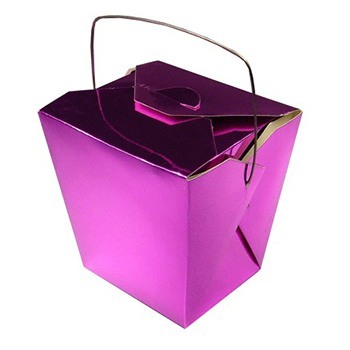 Hey ladies, I ordered these little boxs in red, pink and clear for my Bridal Shower. My Bridal Shower took place in an Asian Restaurant, so the little chinese boxes went perfect. I used pink and red crinkle paper as filler and bought the candy at a wholesale store (Sam's Club) got 2 bags of candy and filled the litte boxes. I finished the look with a small piece of ribbon. Very cute, all the girls really liked them. I am attaching 2 photos of my Bridal Shower, after my MOH and I decorated it. Take a look. 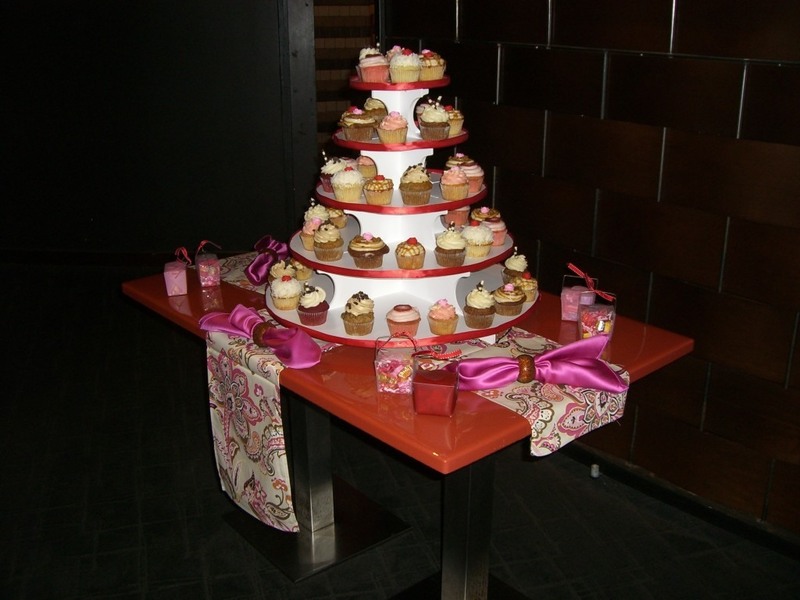 You will see the chinese boxes next to the Cupcake Tower. Good quality and perfect size for two fortune cookies. I also bought a label to match my invites and stuck them on the container. They looked great. Would def recommend. We used these with five large jars of bulk candy for our guest to scoop out and take home. At first I thought they might be too small, but they are the perfect size, are well-constructed, and come assembled. We got a lot of compliments on them. I was worried when I bought these. I thought that they may be flimsy or difficult to work with, or require tape to keep shut, but I was wrong. The boxes are actually ver sturdy. They are easy to put together and once together, they do not pop open or come undone. No taping required to keep them together. Great hit at baby shower! My order was complicated with alot of different personalizations. The people at beaucoup were great about calling and keeping me up to date on the order. They also made sure the cookies arrived un-melted in mid-August in Dallas Texas! Thanks Beaucoup! Great product. 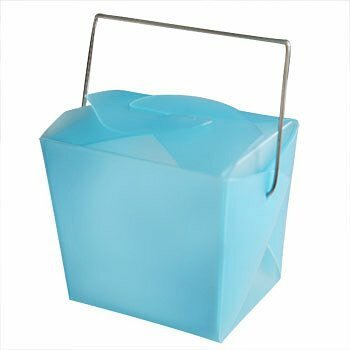 I used these boxes as a party favor for my engagement party at a Japanese restaurant and filled them with candy. They hold about 22 hershey's kisses. Would definitely recommend them and order them in the future. Beautiful boxes that I would use again! I'm using these boxes for my wedding favors and they look adorable with the rest of our decor. I added at personal touch by adding a Thank you card with a metal hoop and I know our guest will love them. I would buy this product again for any occasion! I ordered these (gold ones) with personalized labels. They were a lot smaller than I though they would be or expected.. but they were elegant and cute.. and with the personalized labels were a beautiful addition to my wedding reception.. I put two truffles in each and guests loved it! These were exactly what I was looking for to use as favors for my wedding. They quality was great, the color was exactly what I expected, and I didn't think they were too expensive either! Super cute! I'm going to use these w. LED tea lights inside of them for some extra lighting. They are a little pricy for little boxes but they're not outrageous. They would be cute as favor boxes too. Product was very nice - would definitely order again. Loved the color. I am using this product for my wedding favors. At first the boxes seemed small, but when you fill them with m&ms as I did, they can hold an amazing amount of candy. These are really cute but the only thing I worry about is whether they are safe for direct food contact (as I found from a different website selling the same item). I am going to put the m&ms in a cello bag inside the box (because I love the box so much). I only wish there were more colors. These Chinese takeout boxes were used as favors for a bridal shower. We filled them with M&M's. We opened up the box and the boxes were already assembled. All we had to do was fill them up and close the top. They were very durable. I would use them again! Q:Are the paper boxes food safe or is a liner required? A:I wouldn't put liquidy-food in there, but solid food should be fine. Q:what are the boxes made from such as are they plastic? paper? Q:Do these takeout boxes ship flat or assembled? A:These boxes ship assembled with the top open, so all you have to do is put in the favors or candy of your choice and close the box! A:We recommend comparing the size of your cupcake to the dimensions shown on the product page for the takeout boxes. A:Sample meaning 1 Chinese take out box sent as a sample for your review. Q:How many fortune cookies can fit in the box? A:2 fortune cookies can fit in these Chinese takeout boxes. 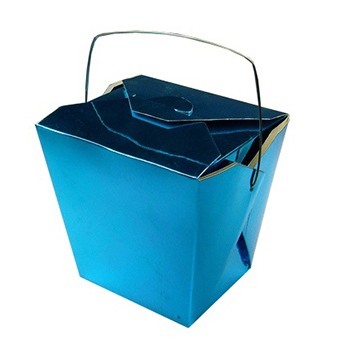 Our vinyl container fashioned after Chinese takeout boxes is a fun and unique way to package your wedding favors. 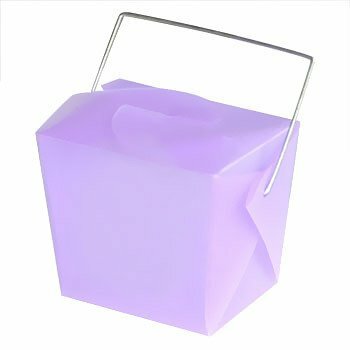 Whether your event is centered around an Asian theme, or you're just looking for an alternative to traditional packaging ideas, the take out box with its sturdy handle and array of colors is the perfect favor container for your guest to take their goodies home. Personalize your box with a designer label printed with your names and the date of your event.